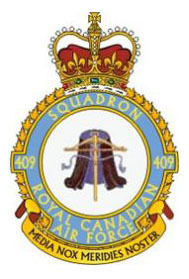 409 Squadron formed at Digby, Linconshire., on 17 June 1941, and was the second of three Canadian night fighter units organized overseas that year (No. 406 came into existence on 10 May and No. 410 on the last day of June). No. 409 adopted the nickname “Nighthawk” and took as its motto the Latin expression MEDIA NOX MERIDIES NOSTER (Midnight is our Noon). The squadron’s badge depicts a crossbow against the background of a black cloak symbolizing its operations of fighting at night. Dad told me once that the crossbow was chosen for the badge because at the time they were flying Beaufighters. The Beaufighter was known for being a difficult airplane to take off in because of the torque characteristics of the Olympus engines when they were advanced to full power. Difficult, or in the parlance of the time, “cross” meaning difficult. Thus the name “cross Beau” or “crossbow”. Is that true? I hope it is. Its a neat airplane story! When the squadron came into existence, night fighting was still a new aspect of air warfare. Research on airborne radar (AI) that would enable a fighter to track and locate an aircraft at night had begun several years before the war, but progress had been slow for emphasis had necessarily been given to the development of day fighters that were to play such a valiant and successful role in the Battle of Britain. Moreover, the Hurricanes, Spitfires were not designed for fighting at night and when the Luftwaffe switched from day to night bombing in the last phase of the Battle of Britain their bombers were getting away almost scot-free. Out of 12,000 night sorties that the Germans flew over the United Kingdom between 7 September and 13 November 1940 only eight were intercepted by allied fighters; 54 were shot down by anti-aircraft artillery. The best brains in the Air Ministry were put to work on the problem of improving night defences with the result that priority was given to the production of AI. Equipped with this new weapon the airmen of the Commonwealth air forces proved themselves as formidable by night as they were by day and eventually drove the German Air Force from Britain’s skies entirely. Unlike the aerial dog fights that took place over England in the summer of 1940, the battle against the night blitz went on unseen and the public learned of the night fighters’ successes only in the newspaper headlines. Many people were unaware that their night’s rest depended on the constant vigilance of the night fighter crews. The only witnesses of the combats in the night skies were the ground controllers in the darkened cubicles at the powerful ground interception (GCI) stations where they observed the course of every aircraft that was airborne and directed the night fighters on patrol. As soon as an unidentified plane* appeared the ground controller guided one of the patrolling aircraft onto it. While the pilot steered according to directions coming over the R/T the navigator busied himself with his radar set; when the AI registered a blip he took over from the ground controller and guided the pilot to within visual range. From there on it was the pilot’s show. Allied aircraft were all eventually equipped with IFF apparatus (Identification, Friend or Foe) which made it possible to distinguish between friendly and enemy aircraft. When scanned by a radar pulse it would respond with an identifying signal to alert the radar operator that this was a friendly aircraft.